Accuchiller EQ Series Chillers feature a compact footprint with an easily accessible interior and a microprocessor that provides precise temperature control and extensive diagnostics. 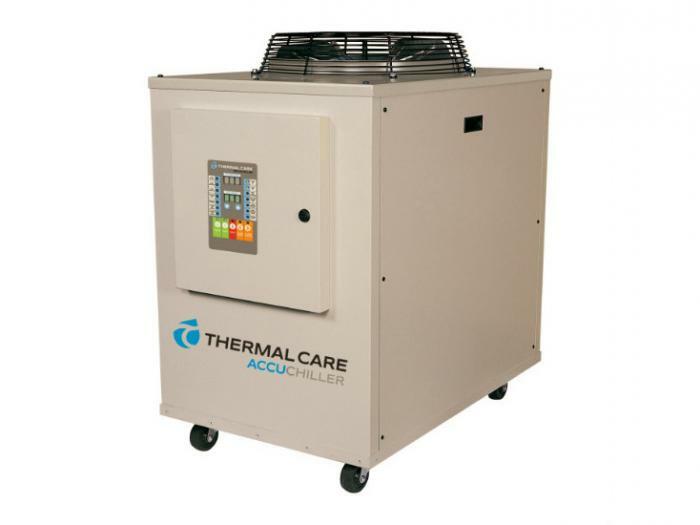 Accuchiller EQ Series Portable Industrial Chillers feature a compact footprint with an easily accessible interior and a microprocessor that provides precise temperature control and extensive diagnostics. Air-cooled, water-cooled and remote condenser models are packed with many standard innovative features that improve chiller performance and reliability. EQ3A01 1.0 20-65² 1,110 ¼ 2 80 12 @ 230/1/60 255 28" x 19" x 33"
EQ2A02 2.0 20-65² 1,585 1 5 39 9 @ 460/3/60 420 40" x 24" x 42"
EQ2A03 3.0 20-65² 2,470 1 7 38 12 @ 460/3/60 430 40" x 24" x 42"
EQR03 3.0 20-65² 6,750 1 7 38 11 @ 460/3/60 430 40" x 24" x 37"
¹Tons based on 50°F leaving water, 95°F ambient airentering the condenser, R407c refrigerant, and operating at sea level. ²Standard set point range is 20°F to 65°F. To extend range to 20°F to 80°F the CPR valve option is required. ³MCA is Minimum Circuit Ampacity (for wire sizing). Model EQ3A01 is only available as a 230 volt, single phase, 60 Hertz unit. 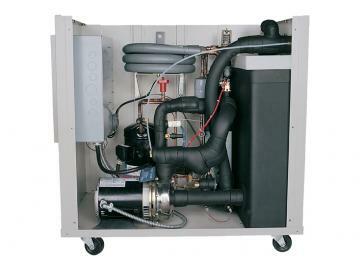 ⁴The remote condenser is only available for use with 230/1/60 main power. LAVB11210 R407C 6,750 1 ⅛ 1 ⅛ 1 ½ 3 565 46" x 39" x 42"
EQ2W02 2.2 20-65² 7 1 5 39 8 @ 460/3/60 420 40" x 24" x 37"
EQ2W03 3.3 20-65² 10 1 8 38 11 @ 460/3/60 430 40" x 24" x 37"